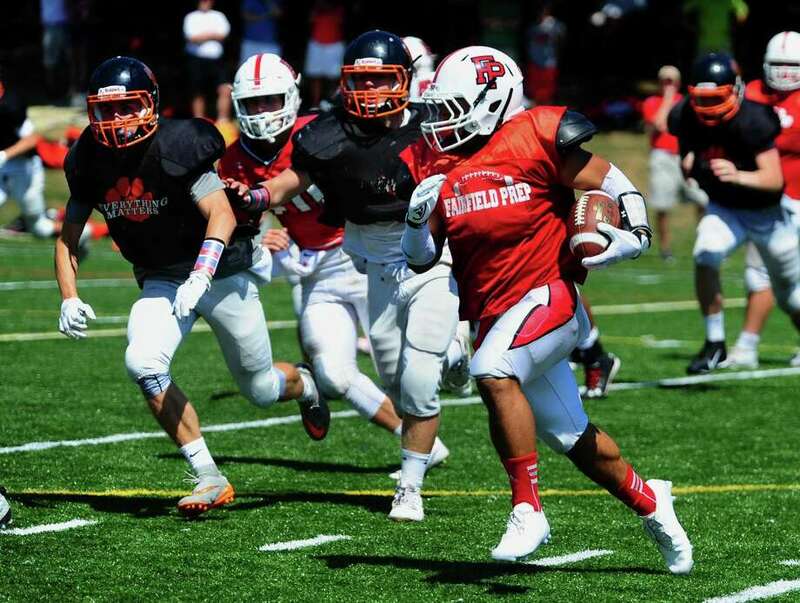 Fairfield Prep's Doug Harrison carries the ball during a scrimmage against Ridgefield before the start of the 2016 season. FAIRFIELD - On a scale of 1 to 10 on the “this stinks” scale, Doug Harrison rated it a 10. “It stunk pretty bad,” he said. One week after rushing for 211 yards and a couple of touchdowns in the Fairfield Prep 2017 season opener against Notre Dame-West Haven, Harrison was doing the same thing to Amity in Week 2, posting 126 yards in the first three quarters. And while visions of a second straight 1,000-yard plus season danced in his head, the football gods had other ideas. With eight minutes to play, Harrison blew out his left ACL. His season was over. He had surgery on October 16 and began the long, slow and painful process of rehabilitation. And for Jesuits coach Keith Hellstern, his rating on the “this stinks” scale was pretty high as well. Still, Harrison and Prep survived. Even with quarterback Will Lucas missing time with injury, the Jesuits went 8-2 and made the Class LL playoffs, losing to Greenwich. For Harrison that “everyone pulling on the oars” mentality also helped with his rehab as his teammates, the Prep coaching staff and even a former player kept giving off positive vibes as he worked to get back into game shape. He did rehab at least twice a week for over an hour and then had to do even more work at home. What was worse was that he couldn’t get to every Prep game to cheer his teammates on. At the Jesuits first practice, Harrison was taking handoffs from quarterback John Iaropoli, making cuts and opening eyes. Harrison feels he’s between 85 and 90 percent and understands that Hellstern is going to take his time in making sure that he’s ready to go. “Coach said that he was going to see what I can and can’t do. We’re going to talk to the doctors and we just don’t wasn’t to risk anything,” Harrison said. Before the injury, Harrison had been talking with Boston College, Rutgers and UConn regarding a football future but for now, all that has been put on the back burner. Right now, the focus is having a big senior season at Prep. A very big senior season.